Hello everyone! Today I have Shobha from Food mazaa with me here. She is sharing a wonderful recipe with us here. Shobha would tell us in her own words about herself and her recipe. It is really amazing how we make good friends in the blogging world. I recently got to know Meena and since we are both Sindhis from Mumbai we had a lot in common to share with each other. I am waiting to meet her when I go back. She is such a lovely person. Her blog RANDOM RAMBLINGS has simple, homely and delicious recipies that we can cook everyday in our homes. I am so glad to do a guest post for her blog. These days quinoa is being used a lot by everyone. However if you don't find it you may use rice flour or corn flour ( makki ka ata , not corn starch) in this recipe. 2. Heat oil in a pan. Take a lemon sized lump and flatten it on the palm of your hand. Deep fry until golden brown. The fritters have a very nice taste of crunchy peanuts. 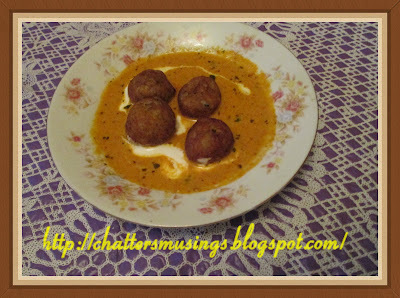 My friends really loved them when I served these..It is a simple recipe and can be made in a jiffy for your guests. Thanks Meena for inviting me to do a guest post for your blog. It was a pleasure doing it for you. Thank you Shobha for a wonderful quinoa corn fritters.They look delicious and yummy to me. So what do you all think friends? Lets hear from you what is your take. Thanks Meena and Shobha for the yummy fritters recipe. Would taste great with a hot cup of tea ! Very healthy fritters....Love to taste this!! Looks crispy and flavorfull... Happy to follow you.. Check my blog when you find time.. Interesting and delicious.. Very nice. Very healthy and inviting recipe. Thanks to Shobhaji and Meena both. Delicious quinoa fritters, yummy and perfect. Lovely guest post,looks so delicious. Thanks you dear friends for all your sweet comments..
Dear Meena, thanks dear for giving me this opportunity. Sorry for the late response as I was travelling. Yummy fritters, feel like grabbing some. Simply superb, so crispy too..
Gr8. Ideas and creative recipes will visit again!